This five-room home is a modern classic. Set in the south-west corner of Pelli Clarke Pelli's newest iconic tower, Apartment 8J offers 1,486' of luxury living at its finest. Enjoy two sunny split bedrooms, each with a sumptuous en suite stone-clad bath. There is a discreet powder room tucked into the elegant front gallery. 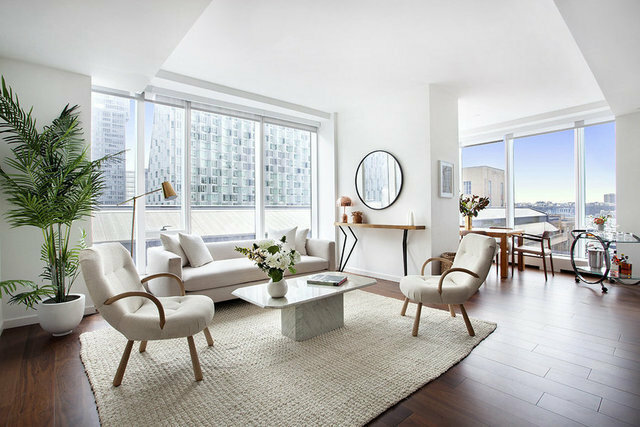 Enter the sun-filled south-facing great room and proceed to an elegant dining area (convertible third bedroom) in the south-west corner of the building, with open skyline views and a peek of the Hudson River. The large Italian-crafted kitchen was designed by Scavolini and features an incredible marble counter and backsplash framing beautiful walnut cabinets and top-of-the-line appliances. The floors are finished with 7.5" walnut planks. The apartment features a washer-dryer and the building is pet friendly. There is a twenty year 421A tax abatement in place, financing is open, and you can sublet immediately after closing. One West End features 35,000 square feet of indoor and outdoor resort-inspired amenities including a 75-foot swimming pool within a double-height cantilevered atrium, a private fitness center and spa, and a 12,000 square foot terrace featuring cabanas, lush green spaces and areas for grilling and outdoor entertaining. Additional grandly-scaled amenity spaces include a living room with fireplace, media, billiards and game rooms, a children's playroom overlooking the garden terrace and a private dining room with chef's demonstration kitchen. On-site parking is available.